AAAAnd the cooking adventure continues. Ever since I started cooking at home, I’ve try to not just cook stir-fries, but instead have a variety of stir-fry, steamed, baked, and grilled food. Up till then, I’ve actually not steamed anything before (ok except for cakes, and …. egg, and bread and rice) No joke, cause I always think that steamed food are too healthy and maybe a bit tasteless. Ok so to prove myself wrong, I used the steamer. My mum bought an electric steamer cause she said we cannot eat so much deep fried / stir fried food, which indirectly means, we should not take food with too much oil!! *jeng jeng jeng* Well I mean it’s true, even though I like to indulge in deep fried oily food, we should still have a balanced everyday diet and keep these oily food far far away. But aiyo, cravings are too hard to resist!!! Balance is the word…. Hence, I’ve started making lotsa steamed food. But also because it’s SO EASY and CLEAN. All you have to do is chop everything, put in the bowl, marinate (if need to) then, turn on the timer and start steaming!! (then you can watch tv or feed your dogs.. while your food is cooking!) Ah, that sounds like a good idea for busy people.. You can always prepare the ingredients in the morning before going for work, then when you come back, just arrange everything together, and steam it! It is as easy as it sounds! 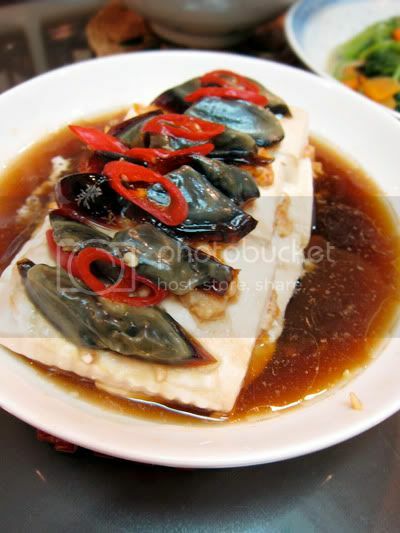 This steamed beancurd is actually quite interesting cause it’s layered (like lasagne) and has century egg (Oh my fav!!!) or rather known as “pei tan” / preserved egg. Chinese cuisine ingredient made by preserving duck, chicken or quail eggs in a mixture of clay, ash, salt, lime, and rice hulls for several weeks to several months, depending on the method of processing. Through the process, the yolk becomes a dark green, cream-like substance with a strong odor of sulphur and ammonia, while the white becomes a dark brown, transparent jelly with little flavor. The transforming agent in the century egg is its alkaline material, which gradually raises the pH of the egg from around 9 to 12 or more. This chemical process breaks down some of the complex, flavorless proteins and fats, which produces a variety of smaller flavourful compounds. From the exterior, it doesn’t look like the regular egg. There are usually wood husks around the egg or mud or sometimes wrapped with paper. 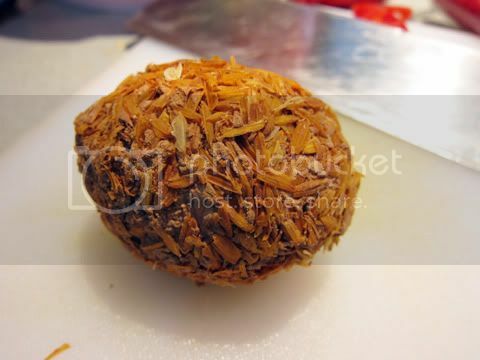 Just remove all the exterior stuffs, then remove the shell and you can eat the egg as it is and serve with preserved ginger. Or you can dice and add them in your pork congee / porridge. Otherwise, steam it like I do..
3. Place a layer of beancurd on a heatproof plate, spread some filling on it, and cover with another layer. Repeat till all beancurd has been used. 4. On the top, spread some minced filling as well. 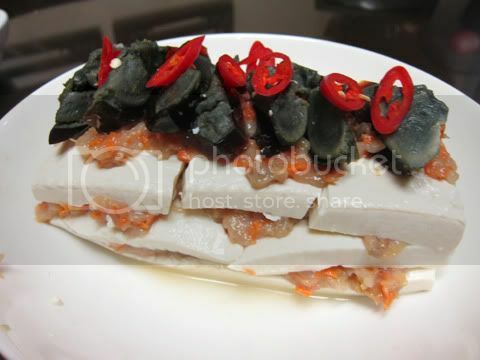 Then arrange sliced century egg on top with some sliced chilli. Steam for 25 minutes until cooked through. Remove from heat, and spoon in ingredients (C) . Serve hot. Will probably make this again after I’m finished with the ever growing “to cook” list. Haha.. 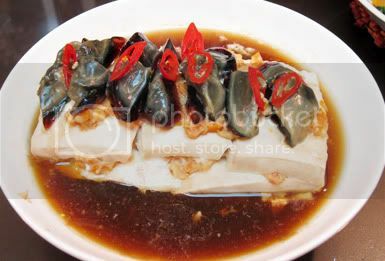 If it’s troublesome to divide the beancurd, you can just make 1/2 of the filling and spread it ontop, top it off with the century egg. Wonderful recipe. Great use of tofu and beancurd. Cheers! This looks so easy and yummy. I love it! Slice only when you want to layer. Place tofu on chopping board, With one palm resting on the tofu, the other with a cleaver, slice it and lightly flip it onto the palm with cleaver. With the cleaver still in place sandwiching the tofu with your palm, lower it onto the steaming plate, cleaver side down and slide cleaver away to place tofu. Put your fillings and slice another piece of tofu again Duh, wonder if you understand me.. hahahah!!! Gosh, I got to try this one day, I mean the recipe. @anncoo : it's nice to eat also!! Eh? so where did u thought I was blogging from ? wordpress? Hi! Any tips on how to get the tofu outta the box neatly ie w/o the sides ‘breaking off’?